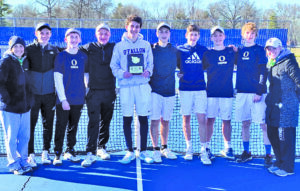 O’FALLON – The OTHS boys tennis teammate off to a very strong start to their season, finishing second in the recent Triad Tournament. The team defeated Peoria Christian, U-High Champaign, and U-High Normal before ultimately losing in the finals to Dunlap, 2-3. Senior Captain Niko Papachrisanthou led the team and was 4-0 at #1 singles. Evan Potter and Gavin Sohn were 3-1 at #1 doubles. Other players competing were Kaden Vollmer, Noah Kellermann, Nic Strobel, Luke Russo, Aidan Kiser, and John Werner.